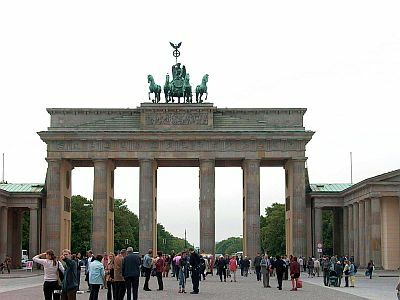 In Berlin, the capital of Germany, the climate is moderately continental, characterized by cold winters, with average temperatures around freezing (0 °C or 32 °F), and moderately warm summers, with daytime temperatures hovering around 24 °C (75 °F). The city is exposed to both cold and warm air masses, so both the weather and the temperature are highly variable. During the warm season, from May to August, thunderstorms can erupt in the afternoon. Precipitation amounts to 570 millimeters (22.5 inches) per year, so it's not particularly abundant, though it's well distributed over the seasons. Winter, from December to February, is cold, with average temperatures hovering around freezing. However, during winter, different situations can occur. When Atlantic currents prevail, there may be relatively mild periods, when it can rain and the temperature can exceed 10 °C (50 °F); in these cases, however, wind and humidity can increase the feeling of cold. Then, there are situations in which a high pressure system dominates, and the weather is cold and gray, with night frosts, and daytime temperatures around freezing, or even a little below. Later, when the westerlies start to blow again, flowing above the layer of cold air, they can bring snow, sleet, rain mixed with snow or rain that freezes. At other times, cold air masses of Siberian origin, can cause snowfall and frost, sometimes intense. In the past, once every few years it happened that the temperature remained below freezing for an entire month; in recent years, it has become more rare, however, cold waves can still occur, which may last for weeks, when the temperature can drop to -20 °C (-4 °F). Spring, from March to May, is a season characterized by unstable weather, with the first warm days alternating with the return of cold weather. March is often a cold month, with frequent snowfalls. In April, cold periods are still possible, with late snowfalls, especially in the first half of the month, but also the first mild days, when the temperature can reach 20 °C (68 °F), especially in the second half of the month. In early May, it can still get cold; with the passing of the weeks, the first warm days occur, with temperatures reaching 25 °C (77 °F) and the first thunderstorms in the afternoon. Summer, from June to August, is pleasantly warm: daytime temperatures hover around 22 °C (72 °F) in June and 24 °C (75 °F) in July and August. However, nights are cool, and sometimes even a bit cold. Atlantic depressions can arrive even in this season, bringing some cool and rainy days, while in periods of good weather the temperature can get close to 30 °C (86 °F). There is some variability from year to year: there may be summers characterized by long periods of warm and sunny weather, and others in which cool and rainy weather is more frequent. However, some hot days, with highs around 28/30 °C (82/86 °F), occur almost every year; occasionally there can even be waves of intense heat, with highs about 36/38 °C (97/100 °F), but usually they only last a day or two. On sunny days, thunderstorms can break out in the afternoon. In autumn, from September to November, the flow of Atlantic fronts, which had never completely stopped, resumes with greater frequency, although sometimes a period of good and unseasonably warm weather can occur, a sort of Indian summer, called Altweibersommer, in September and sometimes in October. Usually, September is still an acceptable month; cold and gray weather usually arrives in the second half of October or more likely in November, when the first snowfalls are also possible. The amount of sunshine in Berlin is not great, however, it is passable from May to August, when the days are also very long; there are about 7/8 hours of sunshine per day from May to August. From November to February, the sun rarely shines and the days are short. As happens in the big cities, in Berlin there is an urban heat island, where temperatures are higher, typically by one or two degrees Celsius, compared with the surrounding countryside, especially at night and in winter. 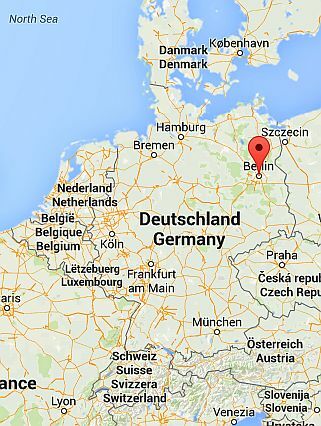 The best time to visit Berlin runs from mid-May to late September. In September, the days are shorter than in the previous months, but the weather is generally pleasant and crisp. However, even in summer it's better to bring some heavier clothes, like a sweatshirt or sweater, and a light jacket for cooler evenings. It may be also useful to bring an umbrella or a raincoat, for rains and thunderstorms.